Welcome | MeetingTool - add value to your event. MeetingTool – Powerful appointment tool. How can it help participants of conferences or symposium to plan meetings around the event participation? 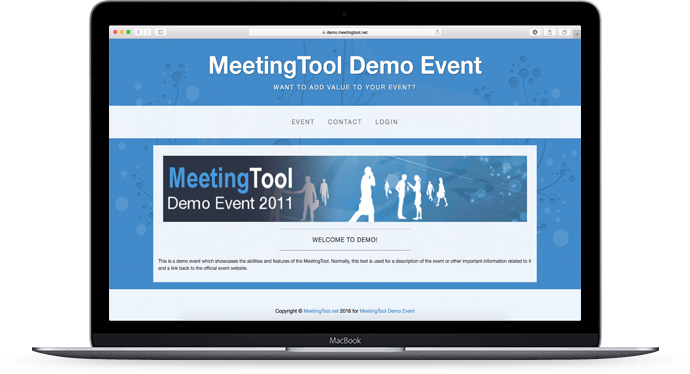 The MeetingTool is a flexible web application written for the purpose of facilitating business meetings during events. It will let you schedule bilateral or multilateral meetings with other active attendees during the special networking slots throughout the event. The MeetingTool enables you to keep track of your business goals and start planning your stay well in advance. You can manage a personal profile and, besides getting access to an enhanced attendee list, will also be able to view other participant's availability to facilitate setting up a meeting.